The Captain's voice bing-bonged into the silence and calmly informed us to assume the brace position. The stewardess asked us to sit down and brace. Forty seconds later everyone began scrambling to their feet. An old man blocked the aisle as he opened the overhead locker seeking his carry on. The stewardess asked him nicely, to forget his bag and move to the front of the plane. Minutes later more than half the passengers who were still on board were informed that they had just died in a fireball as the fuel tanks exploded. I resumed my seat for another round of this evacuation simulation to assess and train flight crew and emergency response to a forced landing at Manchester Airport. Officially, I was already dead, having been one of the unfortunates stuck in the aircraft behind that belligerent old man. In times of emergency, a straightforward command approach to influencing and leading is, perhaps, the only sensible choice. In the next round, the lead stewardess was petite and sweetly asked everyone to sit and relax. This time, they served us a typical airline meal and halfway through, alarms sounded and out of the shocked chaos, a shrill authoritative voice penetrated with absolute clarity of no-nonsense follow these instructions. If I mention Bernadette from the Big Bang Theory you'll likely get an instant understanding of just how commanding this member of flight crew was. The belligerent old man had to retrieve his carry-on of course, but this time, he swiftly moved forward. There just was no way anyone wanted to get on the wrong side of this lady. This time I got to enjoy jumping down the door slide and walking onto the rain-soaked tarmac. This time, all passengers "survived" the fireball. When there is no time for engaging people or asking politely, you can get a swifter response to a clear command. But would you want your boss to use that approach every day? I've had bosses who struggled to influence me well. And I've quit more than one job where the boss barked commands and lambasted us with insults as a means of influence. Influence, like leadership, is situational. There is no one correct style. No one way that works for all people. Flexibility in style is key to being able to influence those you will need to during your life. But because we are better at influencing people who are more like us, we tend to surround ourselves with people we can more easily influence, and those people, well they tend to be pretty well much like ourselves. And we miss the benefits of diversity and innovation when our organisations are filled with people who are, essentially, very much like each other. In this episode, I'm sharing how we tend to surround ourselves with like-minded and similar people, and why that is not in our own best interest. Then I'm going to share the two main approaches to influence and lastly, the five main influencing styles and how you can take my Influencing Style Inventory and get your free profile report. In future episodes, I'll be sharing how you can leverage your Influencing Style and develop greater flexibility. Think of the people you surround yourself with (your chosen inner circle) and you’ll probably find that they are very much like you. We like people who are like us. And, more often than not, when we search for new people to join the team the first question we ask isn't: "What are the qualities and competencies we need to seek and ensure that we benefit from more diversity in this team". No, the question that is asked is: "Who do we know who could.... do this job, fill this role." 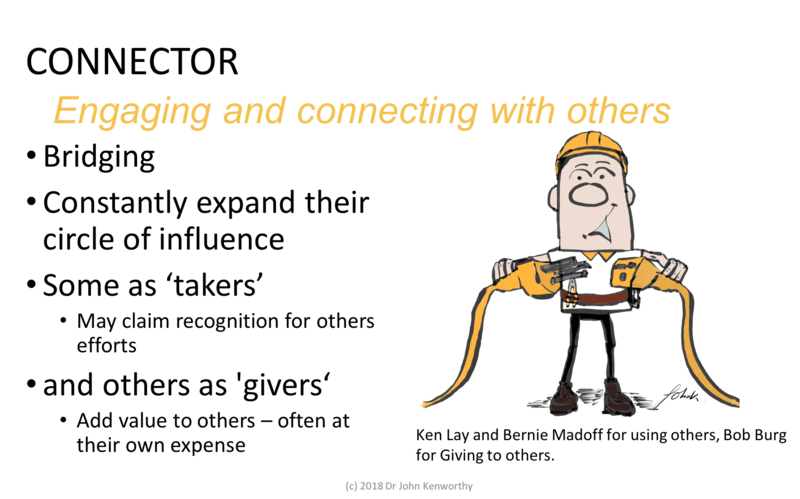 And the chances are that someone will know someone and that someone is going to have more in common with the team members than people unknown to the team. It's also why the most interesting and exciting jobs are filled before you get the chance to apply... unless you are known to someone on the inside. But that's for another day. The biggest downside for organisations is that when it is filled with people who are essentially similar to each other, we have no diversity and few challenges to our way of thinking. We easily fall into groupthink. Remember when you last changed jobs, maybe an internal transfer or to another company. During the first two weeks, you noticed one or two strange things in your new team. They appeared to be wasting time on something, or perhaps they were taking extra steps to achieve a task. You watched, and maybe even timidly asked why. You weren't trying to be difficult, on the contrary, your experience and knowledge is a useful addition to the team, but you are the newbie, and probably don't quite have the confidence yet to insist on a change. The answer to your question "Why do you do that?" was met with a variation on this simple response: "Because that's the way we do it." You might ask someone else, and get a similar response: "Because that's the way it is done. The way we have always done it and it works for us." After a couple of weeks, it's highly likely that you gave in, and started doing things their way. Later, someone new joins the team and shyly approaches you to ask why something is done that way. Your answer: "Because that's the way we do it." You went native and became a coherent and obedient group member. OK, maybe you're different and you managed to influence everyone to change to your, better, faster, cheaper way of doing it... and now that is the way you do it. But John, I hear you object, we don't waste time and the way we do things is efficient and the most productive. Really? How many meetings do you attend that are a complete waste of your time? How much time do you waste clearing unnecessary emails? And why is that... could it be because that's the way we do it around here? "Well I tried to influence them, but they were so stuck in their ways," Bob told me during our coaching session on just this topic. And just how did you try to influence them, Bob? Did you push them or pull them towards a new way of responding? In my research, I've found that individuals exhibit one dominant style of five distinct styles to influence, and two main approaches. The two approaches are a Push approach and a Pull approach. Pushy influencers are people who show a need to control and dominate others. In extreme cases, it's their way or the highway. These people tend to tell, then sell and then some will yell to get you to do something. I spoke about this in my last podcast as the Tell, Sell, Yell approach to management. First, this person will tell you what they want - sometimes very clearly and specifically. Then, if needed, they will sell you on the rational benefits of doing this. If you don't 'see' the benefit and follow the instruction, they may raise their voice to re-explain what and why. These influencers advocate what you should do and why you should do it. This pushy approach works brilliantly well in many situations. Especially those that need compliance and speed of response. Just like that second stewardess, "Bernadette". The other approach is what I call the "pull" approach. 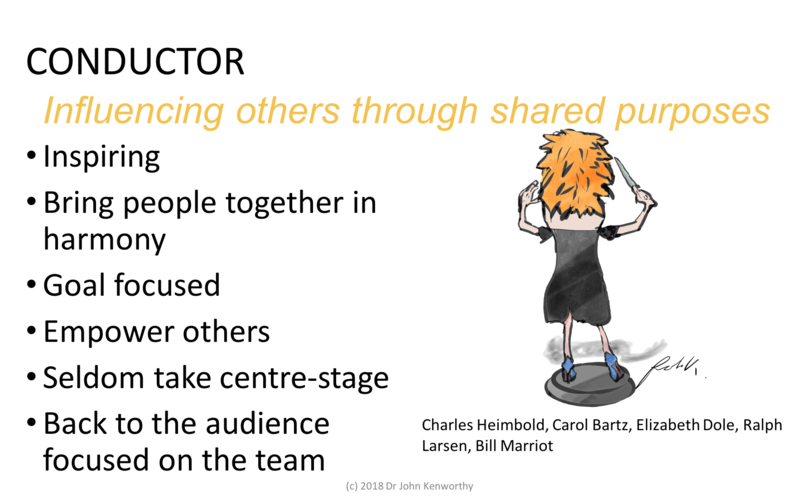 Influencers who choose this approach seek to engage with people emotionally and find shared purpose and meaning. The first stewardess, the one that got half of us killed, she was a little more "Pull". 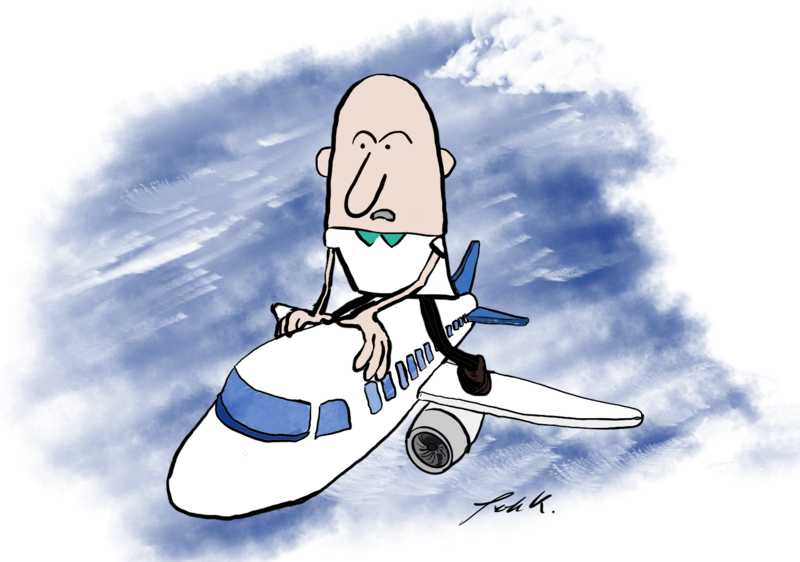 Fantastic for service and making us all comfortable during a normal flight, but as you're about to crash land, you want someone who is unafraid to take charge in the moment. All of us employ both approaches to a greater or lesser degree. 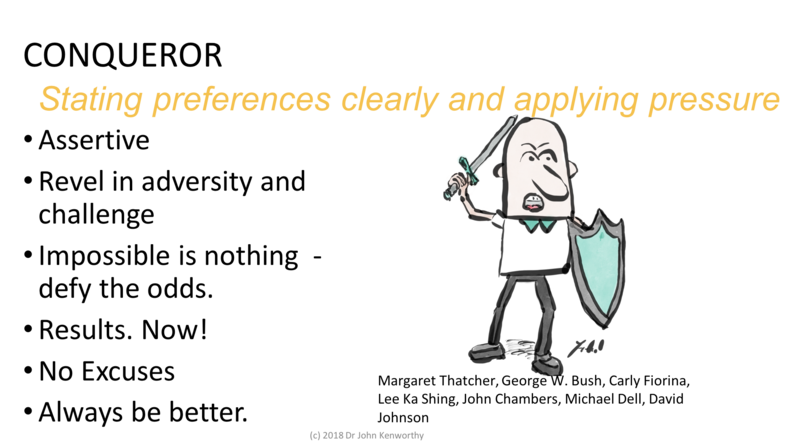 My research shows that we will each tend more towards one approach than the other. There are those of us who are "naturally", though I really hate to use that word, more "pushy", generally more assertive and results oriented. And those of us who are more "pully", engaging people and attracting followers than demanding compliance. Within these two approaches are 5 particular styles that my research has identified. These styles are the Conqueror and the Controller, which are more PUSH in their approach, more assertive and logical. 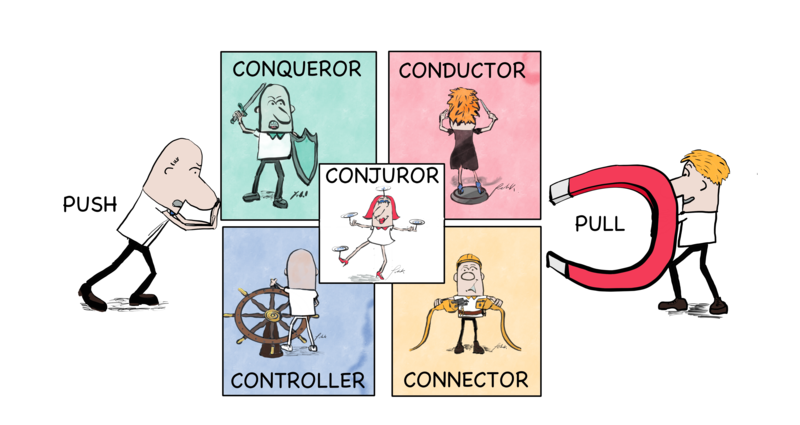 Conductors and Connectors tend to be more emotional and PULL people toward them. The Conjuror juggles the two in the middle. Through my research, it seems that we have a dominant style. Not to the exclusion of the others, but rather this is a default style of influencing. The one that has been the most productive in our experience, and the style we'll default to when under pressure and stress. Like that stewardess on my first evacuation simulation in Manchester, she could easily switch on her barking orders method because, as the smallest in her family of seven siblings, the only way she had been able to win battles at home was to be louder and more commanding. In the other case, she had gotten everything at home by whining and being "rather pathetic", winning sympathy. I know who I would rather be in charge on my flight in the event of an accident. AdvantEdge VIP members to take it entirely for free. The Conqueror is assertive, they state their preference clearly and with authority. This person revels in a challenge and adversity. They focus on results and by that I mean right now! They tend not to endure excuses. If you recall Maggie Thatcher, the so-called "Iron Lady", was clearly a Conqueror in her style - almost to the exclusion of all others. I've worked with many highly successful financial and salespeople exhibiting this style. 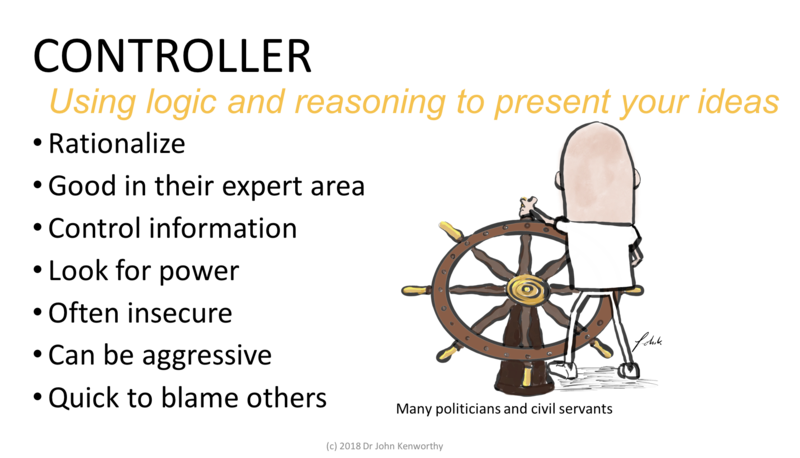 The Controller uses logic and rationale to present their ideas. They can be aggressive and seek power and control information. This style seems to suit the Civil Service well and the majority of politicians. It works very well for the Tell, Sell, Yell management method. 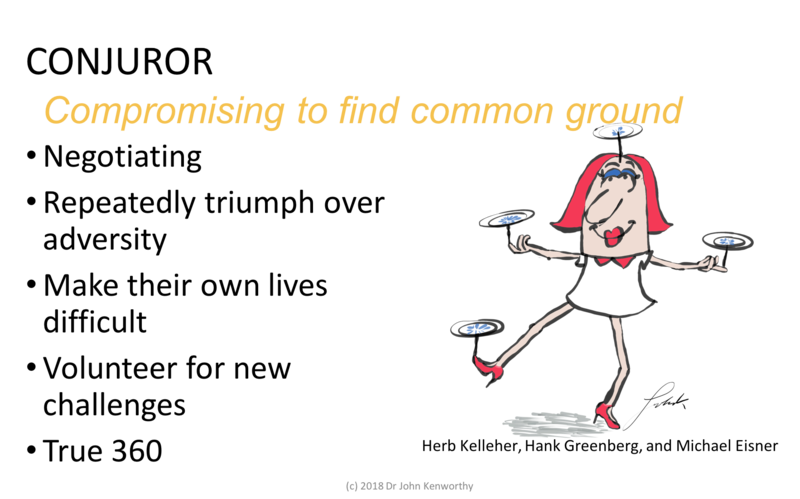 The Conjuror is someone who excels in negotiating to find common ground. These individuals repeatedly triumph over adversity but often make their own lives difficult. Michael Eisner of Disney, Herb Kelleher of Southwest Airlines and Hank Greenberg of AIG show much of this style - working effectively with many challenging situations and coming out on top. The Connector style creates bridges between people. They tend to fall into two distinct camps, those who are "Takers" - those who may claim recognition from others, and "Givers" - those who deliberately add value to others, often at their own expense. Bob Burg is one of the great proponents and examples of the Giving type of Connector. And Ivan Misner, head of BNI. Bernie Madoff and Ken Lay would be extreme examples of 'successful' "takers". Conductors influence others through shared purposes and broader possibilities. They empower others and rarely take centre-stage. They inspire others and bring people together in harmony. I've found through my research, that we each tend towards one dominant style. This is the style that has worked best for us through our lives, usually from a very young age. It's our default style when we neglect to think from the other person's point of view. So, what's your style? I have two things or you to do to hack expert leadership today. Firstly, consider how you influence others. List the top 3 characteristics of how you influence others. Be honest and completely candid. Think of your boss, your peers, your family, your friends. Are you forceful, do you respect them always, do you manipulate, perhaps intimidate? Do you give much and gain little? Do you trade or barter? Do you expect reciprocity? Secondly, take my Influencing Style Inventory and get a free profile report. It takes just 3 to 4 minutes to complete the assessment and I will send you your personally run report within one working day. You'll be able to use this report to get a quick understanding about your dominant influencing style - the plus points about it and some of the potential drawbacks that you may face when trying to influence some people. You'll also learn which style is least dominant for you, weakest is another word. This may highlight why you have difficulties influencing particular individuals and thus provide a possible area for development. In the next episode of the Leadership AdvantEdge, I will share how you can leverage your dominant Influencing styles and improve your flexibility to influence and hence lead more effectively. Until then, here is the link to your Free Influencing Style Inventory.